Martinsville's Public Works - Street Maintenance Department constructs, maintains, cleans, repairs, replaces and marks all City streets, traffic signals, signs, intersections and sidewalks. Typically activities of street maintenance crews consist of constructing and repairing all sidewalks, curb and gutter, and drainage structures. The signal crew maintains all traffic signals and cross walks at intersections throughout the City. Right of ways are mowed, cleaned, and maintained by City crews and inmate labor. The sign crew installs and maintains all traffic signs and pavement markings throughout the City. Pavement repairs and patching are done year round by the pavement repair crew. Public Works is also responsible for clean-up of storm debris from City streets and right of ways. As funding permits, the City contracts yearly with a private paving contractor to resurface City streets. Streets are inspected and reviewed each year. Streets are prioritized for paving depending on the amount of vehicular use, structural condition of the pavement, and the projected life of the pavement. Streets may be entirely repaved or repaved in sections, depending on condition. 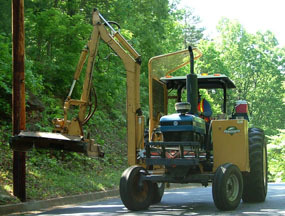 Funds for street maintenance expenses come from the Virginia Department of Transportation, with the City paying one-seventh of the expense. Street maintenance employees work year round, clearing the streets of snow and ice in winter and improving streets and sidewalks throughout the warmer months.